Pour 1/2 cup of water into dutch oven. Heat to 350 degrees for Frying. Add beef cubes and cook covered for 20 minutes, stirring every few minutes. Add rest of water and heat to boiling. Cut carrots, potatoes, and onion into cubes and add to beef. Cook for 20 minutes or until potatoes are soft. 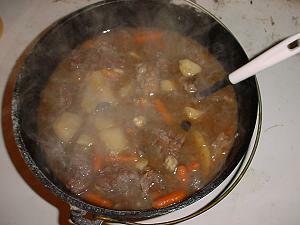 Let me know how you enjoyed your Dutch Oven Beef Stew!